Mabel Marie Perea, age 91, passed away in her home surrounded by family on August 30, 2018. Mabel was born April 24, 1927 to Ben and Maclovia (Mascarenas) Cisneros in Mora, New Mexico. 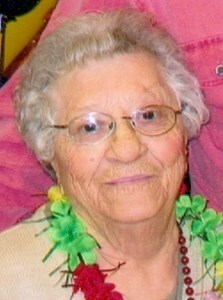 Her family moved to Riverton, WY in 1936. She met Bill Perea in Fremont County and married on December 15, 1946. Bill and her resided in Washington State from 1947 until 1952, and then moved to Casper, WY. She had 3 children, Roger, Lydia, and Lynne. She was employed as a housekeeper for over 20 years. Her passions were camping and creek fishing in the Big Horn mountains, hunting, ceramics, crossword puzzles, playing penny ante poker and going to Deadwood to gamble. She enjoyed bowling and belonged to CWBA until she was 78 years old. She loved feeding everyone. No one ever left her house without a full belly, a full heart, and a few dollars in their pocket. She enjoyed being out doors taking care of her roses, flowers and being at the cabin on Casper Mountain. Everyone will miss her amazing green chili, perfectly round-shaped tortillas, homemade bread, cinnamon rolls and animal shaped pancakes. She enjoyed helping her family so it wasn't unusual to come home from work to find your lawn mowed, dishes done, laundry folded and put away. In her younger days, she would ride bicycles with her grandkids, played baseball without using a glove, and had the patience to play anything that was asked of her from her grandkids. She was always blessing bicycles, homes, and cars with Holy water. Her last few years, she attended the art class at the NIC for those with dementia. Her greatest joys were her kids, and all the grandkids. She never let them forget how much she loved them and how proud of them she was. Mabel will be forever remembered as a loving mother, grandmother, sister, wife and friend. Mabel is survived by her daughters: Lynne Perea, Lydia (Pat) Cordova. Sister: Emma Hawley, Grandkids: Tammy (Chad) Sorensen, Stacey (Todd) Pearson, Marie Cordova, Shelly Ann, Amy (Bryan) Johnson. Great-grandkids: Mitchell, Kylie, Branden, Martin, William, Brianne, Matthew, Bailey, Alex, Wyatt, Mireya, Ariana, Kynlee. Great-great grandkids: Easton, Greyson, Maverick, Kai, Addilyn. She was preceded in death by her parents Ben and Maclovia, husband Bill, son Roger, brothers, Fred, William, Max and sister Cleo Thein. A viewing for family and friends will be Thursday, September 13, 2018 from 6:00 PM-7:00 PM at Newcomer funeral home. A rosary will immediately follow at 7:00 PM on Thursday, September 13th at Newcomers. Mass of the Christian burial for Mabel will be conducted Friday, September 14, 2018 at 1:00 PM at St. Patrick's Catholic Church with Fr. Gary Ruzicka officiating. A graveside service will follow immediately at Highland Park Cemetery. Add your memories to the guest book of Mabel Perea. I remember many days at Mable's house aka "Stacey's grandma's house". She always had cookies and was always in the garden. Some of my best memories were bowling with Mable. She was a force on the bowling lanes, in league or in tournaments. She had the best sense of humor and a heart of gold. I would like to say I am very sorry for the entire Perea family and friends. Mabel, I only just now found out that was her name. I just always knew and thought of her as Grandma. And Grandma always knocked me off. She knew what was what...pretty difficult to get one past her. I know I never did. But she always "busted" you with wisdom. And a smile. I spent many, many great times with Grandma and the whole Perea family. Grandma was always the cornerstone. I will never forget. It was a very long time ago, but for some reason I remember cleaning out a shed or the side of her yard....something...It was a total drag. But Grandma kept us going and at the end, she fed us...like I have never been fed before! I was young...and a boy...food can get things done. I think anyone who was lucky enough to know Grandma should always smile...that is what I feel. She had such an incredible life and touched so many people. I think she was just passing her love and happiness to each of us. I am sad, but way more happy when I think of Grandma. To the entire Perea family, and especially Stacey and Amy and your beautiful families, I am very sorry for your loss. I only wish for everyone to think of Grandma and smile. thoughts and prayers. I have such fond memories of her, and she will be missed by everyone who knew her. No matter how time has passed by the pain actually never completely fades away, its like a cut it bleeds a lot at first and then it heals but a scar still remains. Will you ever forget it, or do you just learn how to get through the day? Eventually, you cope with it but just like that scare, it will always remain to remind you of what happened. But, I hope a smile comes to mind when you think of her joy and seeing her parents, Bill, Roger, Cleo, and her brothers (and her fur babies as well.) Her smile will light your way when its time! I know one thing for sure, I'll be looking that that smile. Love you, sweet friend. Keep that light on! What a beautiful tribute to a vibrant life. My sympathies to your whole family. I will never forget the friendship we had at Shepherd. The games we played with Lynne and Mabel (Abuela) as I called her brought laughing so hard tears flowed down our cheeks and made time go so much faster and easier. Abuela made me feel the most loved when she laid her head on my shoulder and watched a video with me. Thank you Lynne for sharing Abuela with me I will forever remember her. Lynne & Family, I am sorry to hear of your loss, may you be comforted with all the many memories and that she no longer has the limitations that she had here on earth. Thoughts & prayers are with you.